I created this circuit in an attempt to make the simplest possible solar powered project. It would make for an excellent science fair project, and would also serve as a good introduction to solar powered circuitry. It may also have some practical uses, such as shedding some light into a dark part of your house. The idea is simple, the solar panel converts sunlight into a trickle of electricity. The electricity is used to run a white LED. LED Lamp Operating Current: 10-25ma. The remote solar powered LED light takes advantage of the current limited nature of solar photovoltaic cells. If light shines on the solar array, current will flow through the circuit. For a typical size of solar cell, there is a maximum current that can be produced. The maximum solar cell current is simply matched to a value of current that the LED can handle. If there is enough light to raise the solar panel's voltage above around 3.7V, the white LED will light up. The LED regulates the maximum voltage across the circuit to around 3.7V. If the solar panel that you use produces more than 20ma, it may be necessary to insert a series resistor between the LED and the solar panel to prevent the LED from burning out. A 50 ohm 1/4 watt resistor is probably about right for the job, the exact value may need to be optimized according to the solar panel that you use. This concept could easily be expanded to systems with larger arrays of solar cells and more LEDs. The capacitor is not required, but it will keep the LED from flickering if the panel is briefly blocked, such as when a bird flies by. With 7 solar cells, the LED will only light in fairly bright light, if you use up to 10 solar cells, the circuit will work nicely in overcast skies. For an interesting modification to this circuit, replace the 1000uF capacitor with a 1 Farad/5.5V "Memory Backup Capacitor". An Elna DB-545D105 device was tested on the circuit, after charging up in the sun for a few minutes, the capacitor was able to light the LED for several minutes. Most of the work goes into making the solar panel. Lay out the cells in any pattern. Cut the two pieces of plexiglass and one piece of perforated circuit board so that they are wider than the solar array. Stack the three board layers together and drill holes for the mounting screws. When the project is finished, the center circuit board will be spaced away from the front and back plastic panels with extra nuts acting as spacers on the mounting screws. The idea is to get an air gap above and below the circuit board so that there is room for the solar cells and wiring. Mount the solar cells on the perf board and solder them into a series string. An easy way to do this is to connect short segments of bare wire-wrap wire to each cell, route the wires through the perf board and solder the ends on the bottom. Connect two wires to the ends of the series string of cells and secure the wires to the circuit board. For outdoor applications, seal the edge of the panel with silicone caulk or other water proof material. Also, seal the mounting screws where they pass through the plexiglass. Connect the LED and capacitor in parallel, wire them across the two power leads. Be sure to get the polarity correct, otherwise the LED won't light up. Solder the parts together. Be sure to heat-sink the LED leads while soldering, LEDs can be easily destroyed with too much heat. 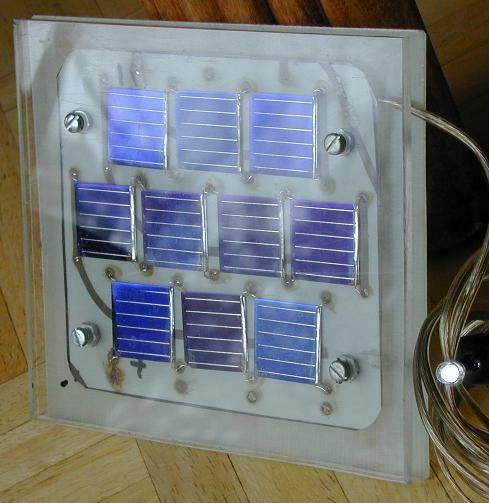 Place the solar panel in the sun, the LED will light. The photo at the top of this page shows the circuit operating indoors on a cloudy day. If you put the LED on a long wire, it can be placed in a dark location, such as a corner of a basement. As long as there is a fair amount of light in the sky, the LED will light up. To get the best orientation for the panel, aim it directly at the sun at noon during March or September in a location that is free from shade. 7-10x photovoltaic cells, rated at 15-25ma each. 1x white LED, high efficiency types work best. 1x 1000uF 15V (or greater) electrolytic capacitor. 1 piece of perforated or printed circuit board. 2 pieces of clear plexiglass. 28 gauge bare wire-wrap wire. miscellaneous screws, nuts, and washers.